The Afrikan Diaspora Dialogue Series is the flagship of Afrikan Unity Initiative and our vessel used to help spread the mission of unity among people of Afrikan descent. The series began at Atlanta Metropolitan College in 2008. It was then taken to Georgia State University in conjunction with the Sankofa Society. After years of hosting the event on college campuses it was time to open the event to the broader community which inspired the creation of Afrikan Unity Initiative. Now the program is free from collegiate affiliation and is open to the public. The goal of this program is to inform and educate people of Afrikan descent of the intentional divisive methods that continue to separate us to this day. We believe that together we can work as a collective to help solve the problems plaguing Afrikans globally. The Afrikan Diaspora Dialogue has been expanded into a series with the following subtitles: Bridging the Gap, Black2Love™, and Black2Health™. The series will be hosted three times a year with each installment being done once. The Afrikan Diaspora Dialogue: Bridging the Gap installment is the original panel discussion, which focuses on raising the awareness of the many Afrikan retentions that exist within the Diaspora. We use these cultural retentions as a linking factor to promote unity among all people of Afrikan descent. Afrikan Unity Initiative also acknowledges that a comprehensive and accurate history of the people and places within the Afrikan Diaspora would create a consciousness necessary to desire Afrikan unity. Because knowing the past highlights and pitfalls of our brothers and sisters from other countries would explain why certain issues persist in those areas. The panel is comprised of people representing various regions that have a strong presence of Afrikan descendants as in the Afrikan continent, the Caribbean, Latin America, and The United States. The Afrikan Diaspora Dialogue: Black2Love™ installment focuses on the commitment it takes to seek Afrikan liberation and unity globally. This particular discussion focuses on the unifying power of love, and how it is a necessary component of any effort toward unity. We discuss how some people become arrogant and pompous once they attain a bit of Afrikan consciousness. This is not love and instead the person who knows should venture to teach those who are unknowing. It is the beautiful burden of those who gain knowledge to pass it forward in order to empower others to grow. The Afrikan Diaspora Dialogue: Black2Health™ installment focuses on raising the awareness of the various ailments that affect people of Afrikan decent around the globe. We have the panel discussion portion in addition to a health fair with free HIV/AIDS testing, Diabetes screenings, Mammograms/Prostate Exams, etc. combating diseases common to people of Afrikan descent. The panel discussion will be about taking preventative measures to avoid these ailments as well as ways to live if you have the sicknesses. We envision this discussion to serve as a catalyst to action in the communities of Afrikans. Our hope is to travel to different places in the Diaspora to host this event and stream the event live over the internet for others to view. Through the streaming there is also a hope for an interactive internet experience where online viewers could join the dialogue through submitting questions via Twitter, Facebook, Google, etc. and we will address those questions and comments live during the discussion. 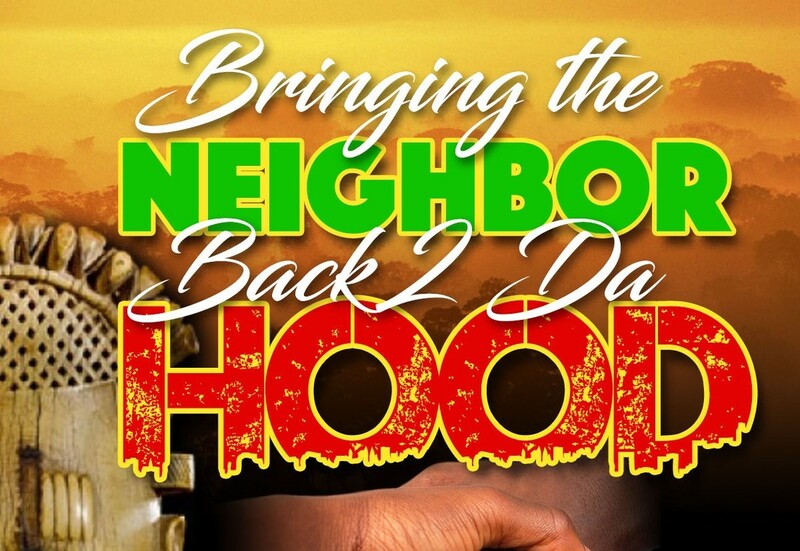 Afrikan Unity Initiative's community development component is manifested through the "Bringing the Neighbor Back 2 da 'HOOD"™ Campaign. This consists of hosting Community Assessment meetings which are hosted at community centers with the intent on empowering people to be the agent of change they desire to see in their lives. During the Community Assessment meetings community members are asked to outline the priorities in the area of things they would like to see improve, things they would like to maintain, and things that they would like to eradicate. An action plan is developed to ensure that these concerns and ideas are successfully translated into action. The primary people responsible for the completion of these projects will be the community members under the facilitation of Afrikan Unity Initiative. Many of the communities that serve people of Afrikan descent have come to be known as the ‘Hood, which implies impoverished residents and substandard housing accommodations. Through this campaign, we hope to bring the spirit of community back to these areas and foster a sense of ownership within these areas. Through these and other activities, we plan to change the face of activism across the globe. This model will work for any community because through the Community Assessment meetings each community gives us what their specific priorities are in that area, and this will be enforced internationally to truly live up to our purpose of Afrikan Unity. Afrikan Diplomatic Ambassadors Fellowship™ is our program offering youths from the ages of 17-21 the opportunity to cultivate their interests in international development. Bridge Builders will craft a relationship between 4-10 youth from 3 countries with a strong Afrikan presence in order to bring to fruition the vision of Afrikan Unity Initiative. We at Afrikan Unity Initiative believe that the people living in so-called developing nations have as much insight into building better nations as those living in developed nations. Afrikan Diplomatic Ambassadors Fellowship™ defies the conventions of international development by creating a 360⁰ exchange program where youths from developed and so-called developing nations both serve as host country nationals and guests in the process of the fellowship. Fellows are empowered to promote hope and the possibility of better realities for Afrikan people. The fellowship will be divided into three phases each focused on building and maintaining bonds that will create strong unity within the community of the Afrikan Diaspora. Bridge Builder Fellowship™ creates the unique opportunity for youths from developed nations and so-called developing nations to equally exchange ideas and best practices in international development. The Housing Project™ is a program with the objective of promoting home ownership for people of Afrikan descent. The program is comprised of two components. The first component is an eighteen-month course that teaches people what it takes to own and maintain a home. Basic principles of ownership, property management, and budgeting are covered in this course. The second component begins after the course ends. Upon graduating this course along with a $20,000.00, down payment people will be recommended for a home loan given by the Afrikan Unity Initiative. Once in the home people will be required to go through home maintenance training for the first thirty months, which will reiterate the basic principles learned in the class, along with the learning of socio-political power that comes with home ownership. Afrikan Unity Initiative is an organization catered toward creating a better world for Afrikans and all people through interactive service and education. We are called an initiative because the word exemplifies proactiveness, which is a necessity when fighting injustice. Our model of empowering people to be the leaders they seek is attributed to the Great Fundi Ella Baker and her participatory democracy methodology. All of our initiatives are designed to work in any place around the globe in order for the organization to help people of Afrikan descent wherever they may be in the Diaspora.